Western blot analysis of extracts from HeLa cells, untreated (-) or treated with Mitomycin C (MMC) (2 μg/mL, 24 hr; +). ATR inhibitor VE-821 (10 μM; +) and/or ATM inhibitor KU55933 (10 μM, +) were added 1 hour prior to MMC treatment. 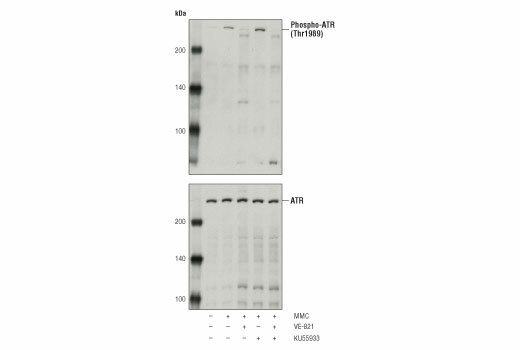 Western blot was performed using Phospho-ATR (Thr1989) Antibody (upper) or ATR (E1S3S) Rabbit mAb #13934 (lower). Western blot analysis of extracts from 293T cells transfected with an expression plasmid encoding a Myc/DDK-tagged fragment of either WT or T1989A mutant human ATR. 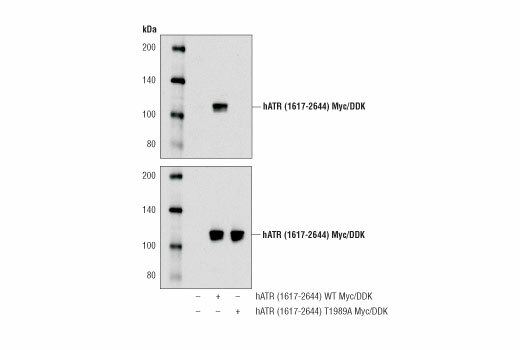 Western blot was performed using Phospho-ATR (Thr1989) Antibody (upper) or Myc-Tag (71D10) Rabbit mAb #2278 (lower). Phospho-ATR (Thr1989) Antibody recognizes endogenous levels of ATR protein only when phosphorylated at Thr1989. Polyclonal antibodies are produced by immunizing animals with a synthetic peptide corresponding to residues surrounding Thr1989 of human ATR protein. Antibodies are purified by protein A and peptide affinity chromatography. Abraham, R.T. (2004) DNA Repair (Amst) 3, 883-7. Shechter, D. et al. (2004) DNA Repair (Amst) 3, 901-8.